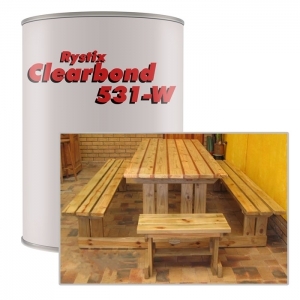 High quality general purpose PVA for bonding a variety of soft and hard woods and when used in accordance with the correct recommendations conforms to the European Standard EN204 / class D3 and South African National Standard SANS 10183-2000 / Class D3. Produces very good water resistance and very good heat resistance properties after curing for 7 days. 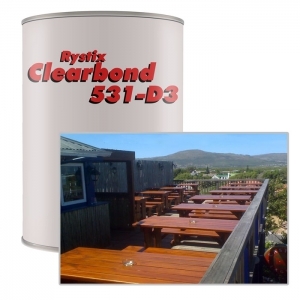 Dries to give a clear glueline and is suitable for use in furniture, laminating, finger jointing and general joinery including doors, windows and frames. The product can also be used for laminating on RF and high frequency presses. can be used for exterior joinery & furniture, must be coated with good quality coating to protect against water ingression / damage. Has improved creep resistance and solvent resistance characteristics. High quality general purpose PVA for bonding a variety of soft and semi-hardwoods and when used in accordance with the correct recommendations the product conforms to the European Standard EN204 / Class D2 and South African National Standard SANS 10183-2000 / Class D2. Produces very good heat resistance and good water resistance properties after curing for 7 days. Dries to give a clear glueline, and is suitable for use in general joinery and furniture manufacture and finger jointing of mouldings for interior application. Has improved creep resistance and solvent resistance characteristics. Mainly used for indoor woodworking and undercover joinery.